Here’s the first post in a new series on my blog… Sachie’s Food Tour! 😀 If you’ve been following me on twitter or instagram, you already know that I recently went on a trip to Los Angeles, California, for Anime Expo! I had a fantastic time at the convention….but an equally as exciting time feasting at various food trucks / restaurants! I love food, and blogging…. so adding a food blogging feature on this blog was a natural path! Hopefully I’ll help out a few of you guys who are looking for places to eat! Alright – first day of Anime Expo. It’s a huge convention, which means that most restaurants in the area will be full of cosplayers. Tired, hungry, and having to wait in massive lines? No thanks! Luckily across from the convention centre, there’s a huge parking lot full of food trucks!! 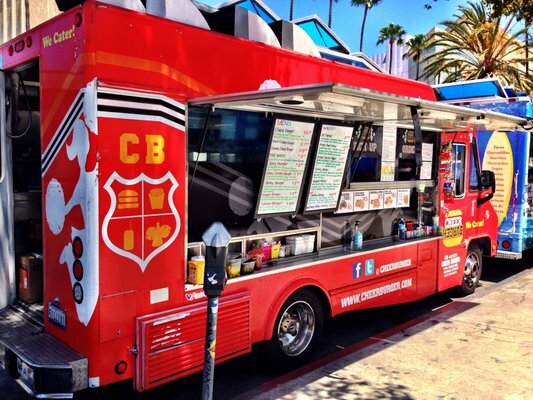 Everything from sushi burritos, pho, riceballs, burgers, boba tea…..and more!! I decided to eat at Cheer Burger! I was drawn to the brightly colored truck, and the fact that I was seriously craving a burger. 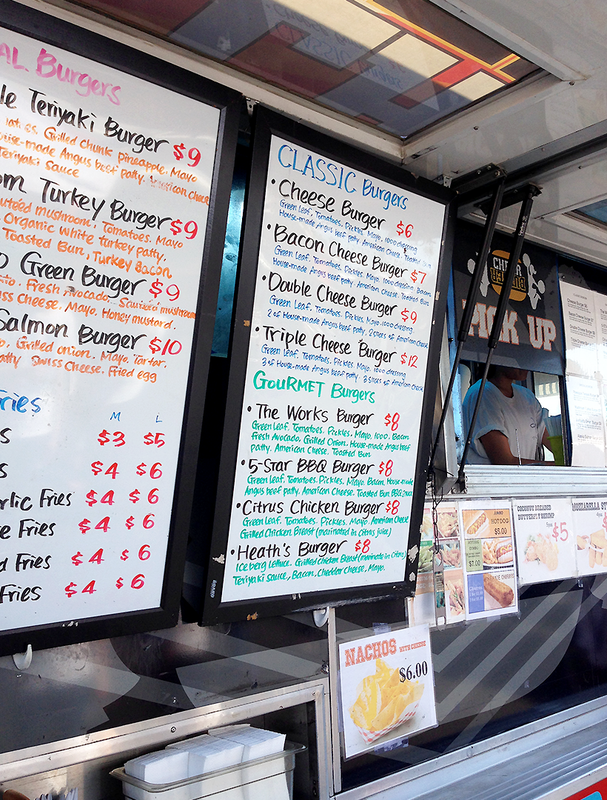 It was only around noon and the line for cheer burger wasn’t too long, so I took a look at their menu. I ordered “The Works Burger” ($8) which has lettuce, tomatoes, pickles, mayo, 1000 island dressing, bacon, fresh avocado, grilled onion, home made angus beef patty, american cheeze, topped off with a toasted bun. Starting to crave it again…. 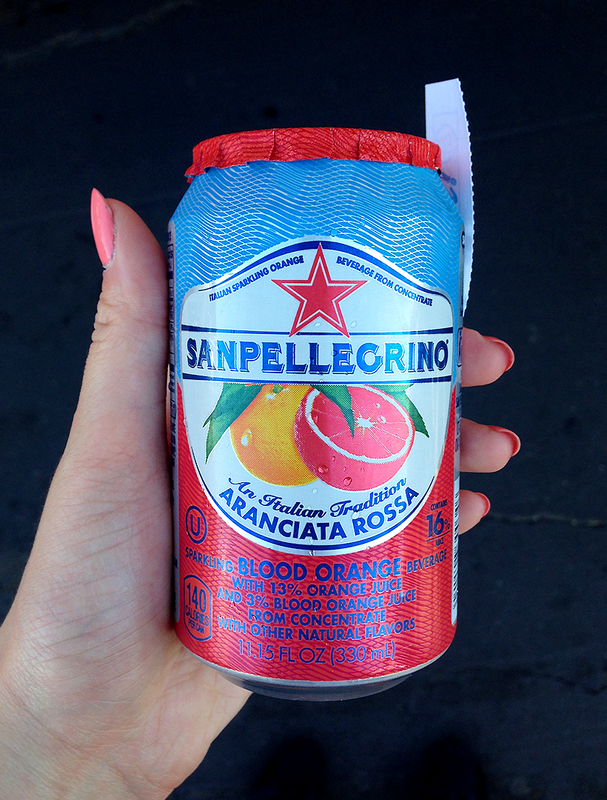 Hot day, so I got a Sanpellegrino sparkling blood orange drink! Tastes good but seriously overpriced – it was so hot that I didn’t even care anymore! If you’re going to a con, bring your own drinks. THIS. 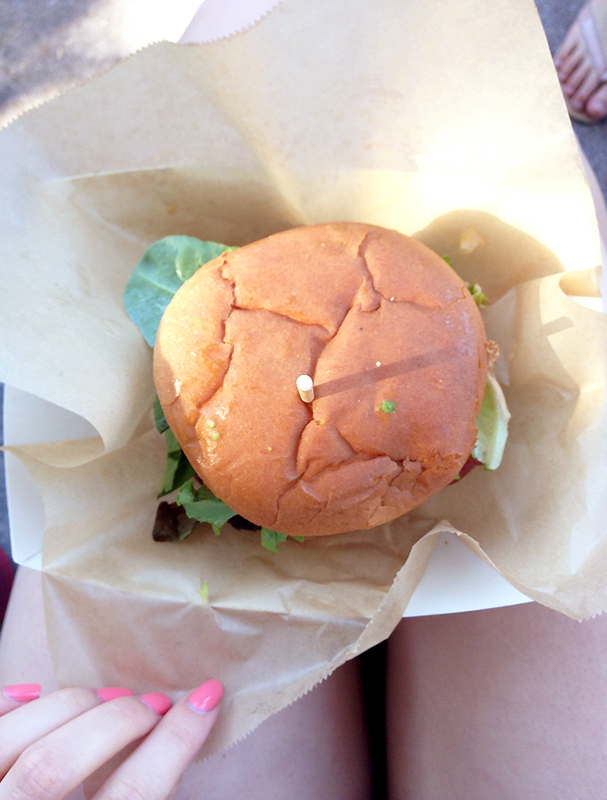 THIS WAS SUCH A GOOD BURGER. Seriously!! Fresh veg, thick beef patty, yummy sauces dripping out… The avocado coupled well with the crispy bacon… aaahhhh I’m itching to get my hands on another one! (Why don’t they have one in Toronto, why???) For some reason this food truck has bad reviews on yelp, but I think they’re just from impatient customers who had to stand through long lines. I haven’t had anything else on their menu so I can only attest to the burger that I had. 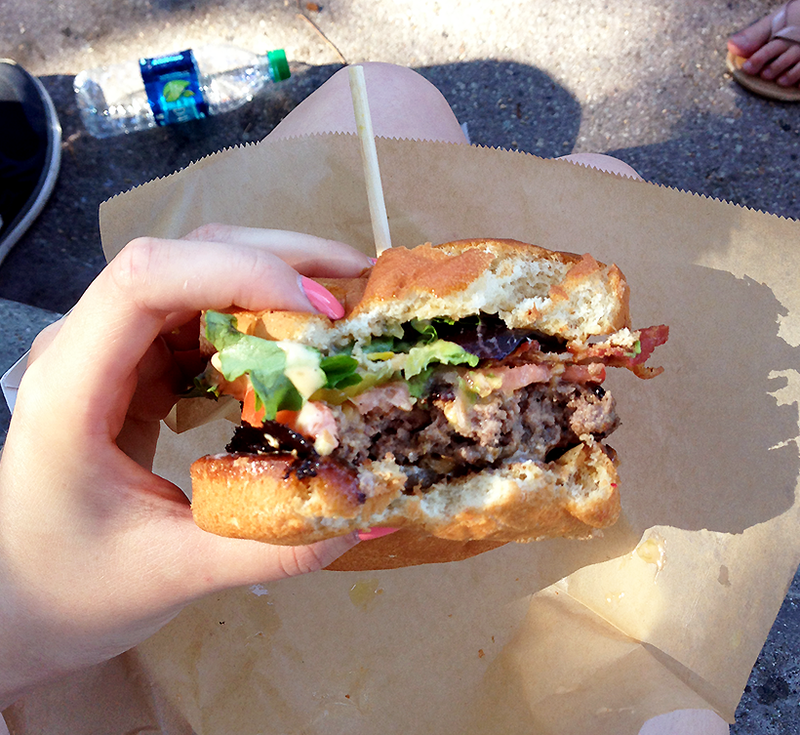 I can confidently say that this burger lasted about 2 minutes in my hands. If you’re in LA and see Cheer Burger, grab “The Works“ burger! I guarantee that you’ll love it! Follow Cheerburger on Facebook / Twitter! You can also find the rest of my California food tour series here!